-- Select a Size/Color -- 5/8" x 4' Length - Out of Stock! 1" x 6' Length - Out of Stock! The Barking Basics!® Dog Leash in Red is a durable and classic design that is perfect for any outing. This Barking Basics!® Dog Leash in Red is a staple for any dog's walking wardrobe. Each dog leash features a nickel-plated swivel clip for a quick and secure attachment. Matching collar sold separately. This red-colored leash is great because it's easy to spot. It's also a popular choice for Christmas, Valentine's Day, and patriotic holidays. Our red leash and other Barking Basics products will also move your pup to the head of the team by sporting team colors! Football fans that will love our orange Barking Basics leashes, collars, tanks, and hoodies include the Atlanta Falcons, the Buffalo Bills, the Houston Texans, the New York Giants, the Kansas City Chiefs, the New England Patriots, and the San Francisco 49rs. Baseball fans that will embrace our red Barking Basics line include the Boston Redsocks, the Chicago Cubs, the Cincinnati Reds, Cleveland Indians, Los Angeles Angels, Minnesota Twins, Philadelphia Phillies, the St. Louis Cardinals, Texas Rangers, and the Washington Nationals. For basketball fans, the Atlanta Hawks, the Chicago Bulls, the Detroit Pistons, Houston Rockets, Los Angeles Clippers, Philadelphia 76rs, Portland Trailblazers, and Washington Wizards will love to check out the entire red Barking Basics line for the ultimate in team spirit support from your dog's corner! As for hockey fans, our red Barking Basics products will appeal to the fans of the Carolina Hurricanes, Detroit Red Wings, New Jersey Devils, and the Washington Capitals. 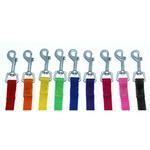 Collect every Barking Basics leash color to suit any outfit or mood! At this value price point, you'll never be without a handy dog leash. Keep one at every exit and in every vehicle! Posted On 03/16/18 by Kimberly S from , CA Yes, Kimberly S recommends this product! Awesome color and great quality. Great purchase. Posted On 09/15/17 by Ann Marie T from Holyoke, MA Yes, Ann Marie T recommends this product! Posted On 07/21/17 by Marcia M from Fairview, TX Yes, Marcia M recommends this product! I previously purchased the 1" wide 6 ft. leash in orange. I found this leash too wide and the clasp too heavy so this time I went with the lighter and narrower 4 ft. leash to go with a matching collar. The only thing I would change is the length. Wish a longer leash (5 or 6 ft) could be purchased in the narrower width. I like the red color better than the orange. Posted On 06/12/17 by Bob and Patti Stanwood from HOUSTON, TX Yes, Bob and Patti Stanwood recommends this product! Posted On 06/11/17 by K from San Diego, CA Yes, K recommends this product! This is a great light weight leash for smaller pups. Well made and a perfect color red. My pup loves it! Posted On 05/01/17 by Patricia O from Alton, IL Yes, Patricia O recommends this product! I prefer the heft of the 6' over the 4'. I didn't realize how much till I tried the 4'. The 4' may have its uses so happy I have it! Posted On 03/09/17 by Ann B from Folsom, LA Yes, Ann B recommends this product! Posted On 12/27/16 by Ann Q from Palo Alto, CA Yes, Ann Q recommends this product! Good buy. Nice and lightweight. 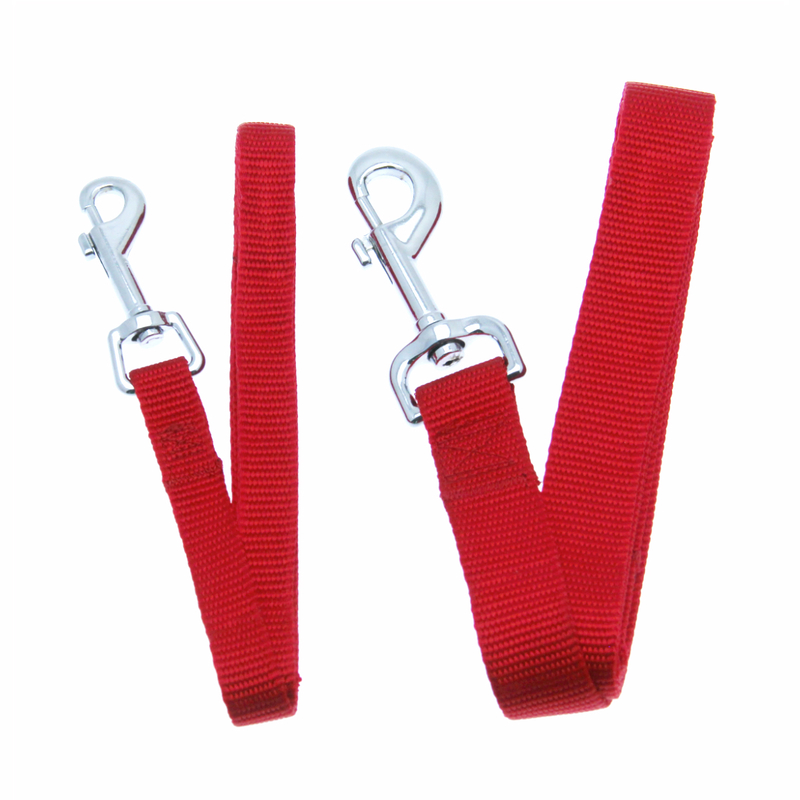 Versatile, use with any collar/harness that's red to complete the look. I used it for the Puppia Blitzen Harness and it matched perfectly. Posted On 12/16/16 by Joyce J from Sarasota, FL Yes, Joyce J recommends this product! 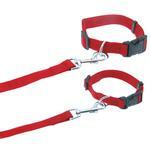 This is a nice leash for the price, I have them in different colors. I like the 4 ft. long leash for going on our walks!!! The Barking Basic Leash is well made and I suspect it will look good and hold up for a long time!!! Thank you Baxterboo !!! Posted On 12/08/16 by Rosie from , CA Yes, Rosie recommends this product! I liked these so much and the price was so good I bought one in each color. Very tough and we'll put together. Check out the matching collars! Posted On 06/30/16 by K911 from , Yes, K911 recommends this product! Posted On 06/21/16 by Alexandra K from Virginia Beach, VA Yes, Alexandra K recommends this product! This leash was just as pictured. It's a vibrant red, thick and good quality. Can't beat the price! Posted On 06/19/16 by Kim C from Omaha, NE Yes, Kim C recommends this product! I like the feel of the leash as my dog is pretty strong. It works well with the collar or harness. Posted On 06/01/16 by Andy B from Palm Desert, CA Yes, Andy B recommends this product! We are a rescue group. Often our shelter dogs are ready to chew on their leashes at every chance. They are also escape artists. 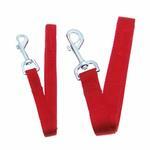 Your leads are sturdy fabric, and have great easy to use clasps. We have already given them to our adopters and foster parents. Love this product. They are especially cute with your matching harnesses. Posted On 05/29/16 by Beth S from , FL Yes, Beth S recommends this product! Color is great - I wanted a longer leash which is great but the buckle is a little heavy for a shih tzu. I purchased this red leash because it matches many of my boy's clothes and collars. Posted On 04/25/16 by Charlene S from San Diego, CA Yes, Charlene S recommends this product! This appears to be a well made lease with a nice clasp. Looks and feel durable. This is to be a gift to a new rescue dog owner, so I am very happy with it!! Nice basic red leash. Bright color. Posted On 04/14/16 by barbara S from , AR Yes, barbara S recommends this product! Posted On 04/04/16 by Cade O from Santa Rosa, CA Yes, Cade O recommends this product! Same product found in my local store but this was about 75% of the local price. Now I want one in each color. Great quality. Vibrant color. Am going to purchase the 6' leash today! Posted On 12/01/15 by Joanne T from Stuart , FL Yes, Joanne T recommends this product! What an amazing staple for any pet owner! Posted On 11/29/15 by Terri P from , Yes, Terri P recommends this product! These leashes are great and this pretty red one will look wonderful with my dog's Christmas dress! Great price, too! Posted On 08/10/15 by Lacy J from , Yes, Lacy J recommends this product! this leash stands up to the wear and tear my dogs put out. my pup even chewed on it and she wasn't able to chew through it. Would definitely recommend this product and will be sure to get more.